Many survival games are focused on you being a lone person in a vast wilderness. Imagine, however, if you had a giant robot that you could pilot around? That's pretty much the premise for Goliath, a new survival/action game being developed by indie team Whalebox Studio. 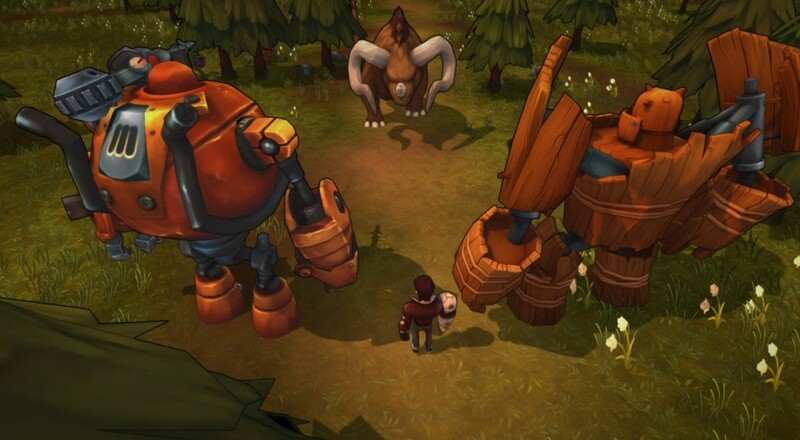 The game was first teased during last year's E3 with a trailer that showed a forested landscape and a wooden robot punching some monsters. Since then the game has found a publisher, a firm release date has been set, and some more info about what kind of survival you'll be doing has been revealed. The title supports four player online co-op throughout the entire campaign. Players will be able to team up to gather materials and build bigger/better bots. Along the way, you'll encounter various factions in the world, like demons, sentient robots, and other humans, that you can befriend to learn new designs. Each player's world is uniquely generated and the good news is that if you find something really cool in your buddy's world, you'll bring that new design/material/loot over to your own. Goliath launches on Steam on May 12, 2016, for $19.99. Page created in 0.7802 seconds.